A Modern Twist on a Beloved Tradition. 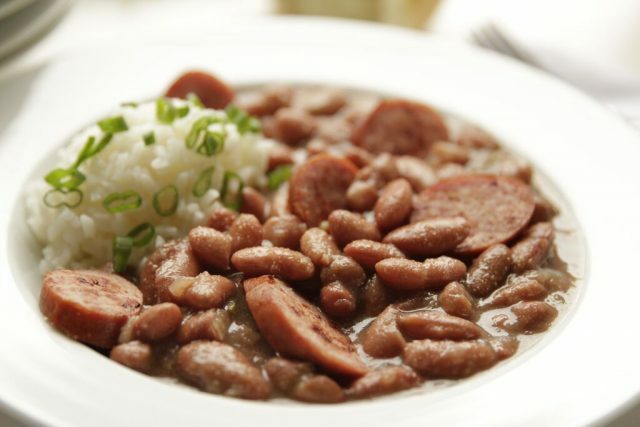 Here in New Orleans, many of us observe the weekly tradition of cooking red beans and rice on Mondays. The traditional method takes several hours to cook from scratch on the stovetop (assuming you’ve not soaked them… ). Most of today’s modern, busy workers leave their homes early on weekday mornings making that four hour stovetop cook time pretty unrealistic. What to do? If you love red beans but haven’t the time to cook them, meet your new best friend: the slow cooker. 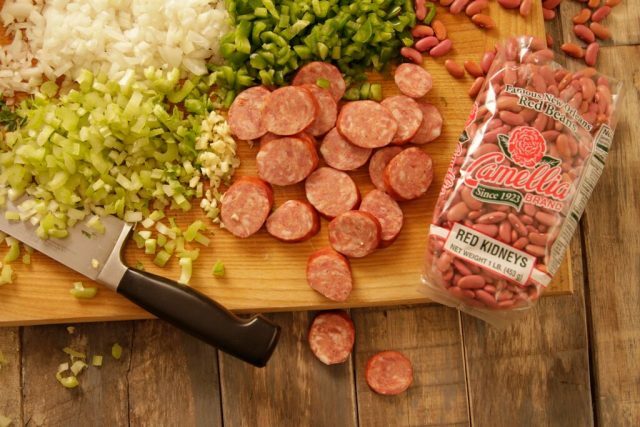 With just a little ahead-of-time preparation, you can have red beans not long after you get home. How’s that for convenience? 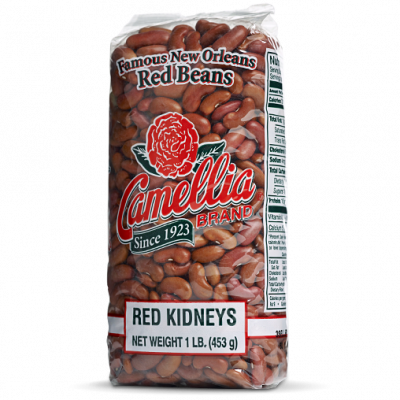 Not only is the consumption of red beans a big deal here in New Orleans, but the ritual of preparation is also a time honored tradition. Slowly chopping the trinity can be the closest thing to a meditative experience as you’re likely to find in the kitchen. However, if you don’t have the time, several companies here in Southeast Louisiana figured that out – so you can now find pre-chopped trinity in most, if not all, grocery store refrigerated produce sections. Today’s busy home cook doesn’t always have the time for a lot of prep-work, especially when it’s just as cost effective to use the pre-chopped version. Let’s loop back to the slow cooker. Clearly, advantages abound here. Not only are slow cookers convenient and easy to use, they’re also a major time saving device. Plus they eliminate the need for soaking, especially when you’re cooking them low and slow, as does the recipe presented here. 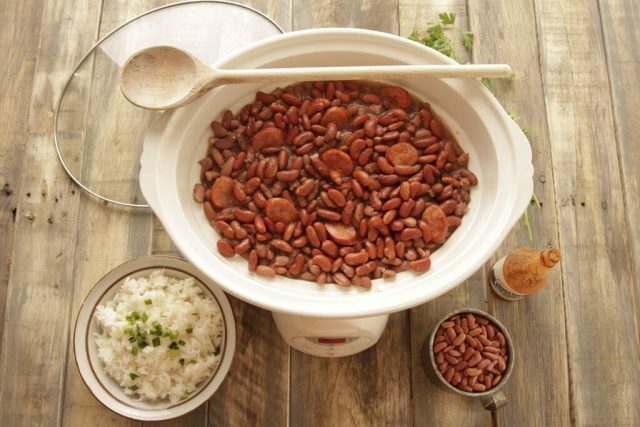 While you’re busy at work all day, the slow cooker is busy, too – it’s turning the red beans, smoked sausage, and trinity into a delicious meal for you. When you arrive home, your beans are ready. Simply throw on a pot of rice and slice a few green onions, and you’re all set! This is so easy that a child could do it. In fact, cooking red beans in the slow cooker is a great way for you and your kids to bond over meal preparation, and it also provides a convenient way for you to pass the red beans and rice tradition on to them. While cooking traditions persist, modern day time crunches call for modern day solutions. The slow cooker provides that answer. 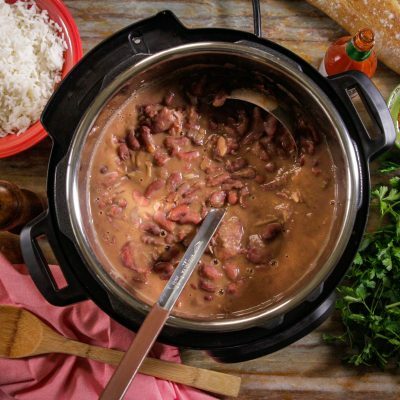 Embracing slow cooking allows you to cook traditional meals like red beans more often. Between using it as family bonding time and having Mondays be an easy dinner night, you’ll wonder why you didn’t start this tradition earlier. 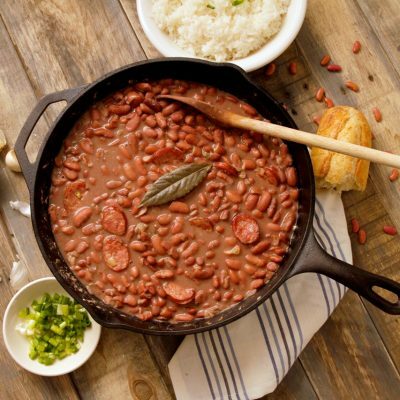 Red beans also make great leftovers for lunches during the week or they can be frozen to eat later, especially on those weeks when you don’t even have the time to use the slow cooker. You know those weeks. 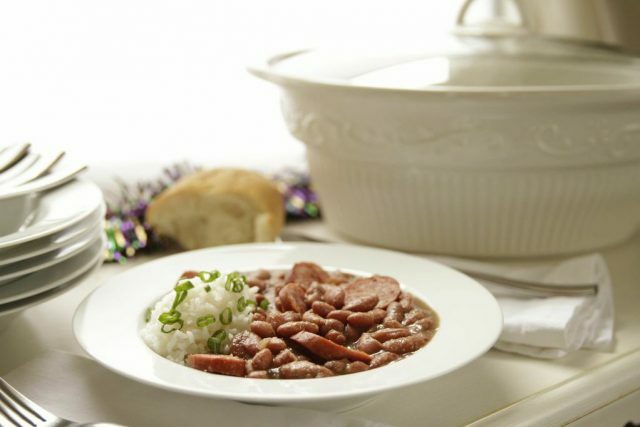 The versatility and storability of red beans makes them an ideal weekly tradition. 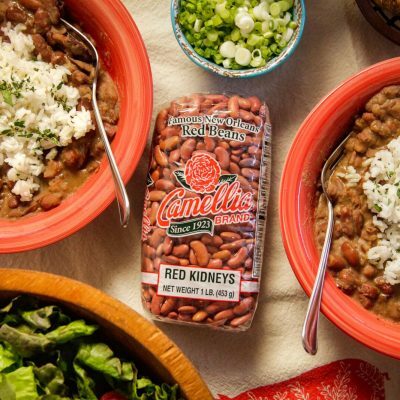 Slow cooking your red beans is also ideal for parade season and parties for the big game – you can enjoy the festivities while the beans are cooking, and serve directly from the slow cooker so that everyone can enjoy a piping hot bowl of New Orleans most beloved dishes. If you cannot find pre-chopped trinity in your local grocery store, substitute 2 cups of chopped onions, 1 cup of chopped celery, and 1 cup of chopped bell pepper. Steps 1 through 3 can be done the day ahead of time, if needed. Store the cooked vegetable and sausage mixture in an air tight container in the refrigerator then just pick up on Step 4 when you’re ready to add everything to the slow cooker. If you’re strapped for time, skip Steps 1 through 4. Sauteing the trinity and the sausage will add a depth of flavor, but it’s not a requirement. If you skip over to Step 5, add the raw vegetables and sausage to the slow cooker with everything else. Omit the vegetable oil. Depending on your beans and your slow cooker, the beans may have more water than you’re used to on the stove. The beans will thicken upon standing. Mash some of the beans on the side of the slow cooker crock if you prefer a creamier style of beans. The beans can stay in the slow cooker for another couple of hours on the “Warm” setting on the slow cooker. Beans will continue to thicken as they warm longer.